Since the first rollout of official mod support for Final Fantasy XV on PC arrived, allowing players to replace character and item models with whatever they liked, there have been many wonderful – and not so wonderful – creations available. 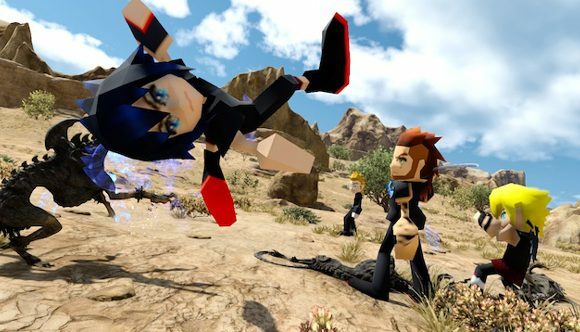 Now, at last, one modder has made it so Final Fantasy XV can finally be experienced as it was meant to be played… with blocky, low-polygon models that were the height of technology in the PS1 era, just like how Cloud and pals appeared in Final Fantasy VII. Modder Kyriya has added gorgeous, chunky model replacements for all four main FF15 party members. She’s even converted their beloved Regalia car, which features a wonderful recreation of what transparent textures looked like in games circa 1997. The ‘FFXV Regressed’ mod pack is available on the game’s Steam Workshop channel, so it’s very easy to get them working – simply click ‘Subscribe’ next to all the mods and the new models will get automatically applied in-game. Bear in mind, FF15 only currently supports one replacement mod at a time for each character, so if you want to add any more you’ll have to unsubscribe from these – or you can use the ‘outfit’ version and equip it in the game’s Gear menu, which bypasses that problem. The models are based on a video from The Regressor, aka Regressive Mark, which reimagined Final Fantasy XV as a PS1-era game. Now finally, with the PC release and mod support, talented modders can make these bizarre dreams a reality – or even Donald Duck in a mech suitDonald Duck in a mech suit if they prefer. Kyriya is also responsible for the similar (and equally excellent) mod pack that replaces the FF15 cast with their mobile Pocket Edition versions, which is currently the only fan-made mod to have been recognised by Square Enix since the mod tools launched – and has actually been made an ‘official mod’ alongside Gordon Freeman’s HEV suit and the ability to replace NPCs with Cactuars. We prefer blocky to chibi, thank you very much.